Siddal came back from 14 points down to score a fine 26-14 victory away to National Conference League champions West Hull yesterday. Wests came out of the blocks fast and were over for their first try after two minutes. Following a scrum close to the Siddal line, the ball was quickly transferred left to fullback Brett Turner, who accelerated through a gap to score. Scrum half Ian Kerman converted. Siddal couldn’t get started and were also on the wrong end of the referee’s decisions. With possession and territory in their favour, West Hull capitalised with further tries from Matt Plummer and Callum King plus an Ian Kerman conversion to race to a 14 point lead at the end of the first quarter. Siddal rallied through forwards George Ambler, Gareth English and some fine kicking by scrum half Liam Coe. It was English who started the fight back, managing to get the ball down wide out on the right in spite of the attentions of three West Hull defenders. Coe added a fine conversion. It got better for Siddal three minutes later when debutant Taniela Bakosa, out on the left wing, challenged for a high last tackle cross field kick by Coe. He came down with the ball and ran 15 metres to score by the posts. Coe’s conversion closed the gap to 14-12 and as the game reached half time Siddal could sniff the momentum. The visitors made a sluggish start to the second half but kept West Hull out with great defence. Once they had some possession, Siddal were clearly the more threatening as centres Chester Butler and Billy Hammond ran hard and took the energy out of the home defence. On 50 minutes Siddal went in front through a Ross White try and though Coe surprisingly missed the conversion, Siddal had their noses in front. West Hull were visibly tiring despite the efforts of their stand out performer, loose forward Ryan Steen. 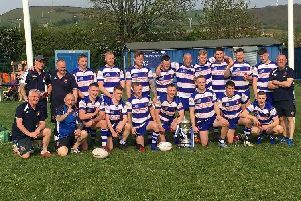 Siddal began to stretch their line with quick handling through Coe, Shaun Garrod and fullback Freddie Walker, who was joining the line more regularly. The visitors increased their lead through Hammond, who took an inside pass and cut through. Although he was brought down inches short, he was able to stretch out and place the ball on the try line. Coe converted and Siddal had breathing space at 22-14. The game became scrappy as the referee penalised both sides for interference at the play the ball and West Hull became more desperate to get back in the game. Siddal clinched victory with Hammond’s second try. The West Hull right winger dropped a high kick by Coe just feet from his own line and Hammond had the easy task of picking the loose ball up and scoring. Coe couldn’t add the goal from the touchline. Coe took the Siddal man of the match award and there were great contributions by English, Hammond and Ambler.